12 April • Provincial Rector Fr. 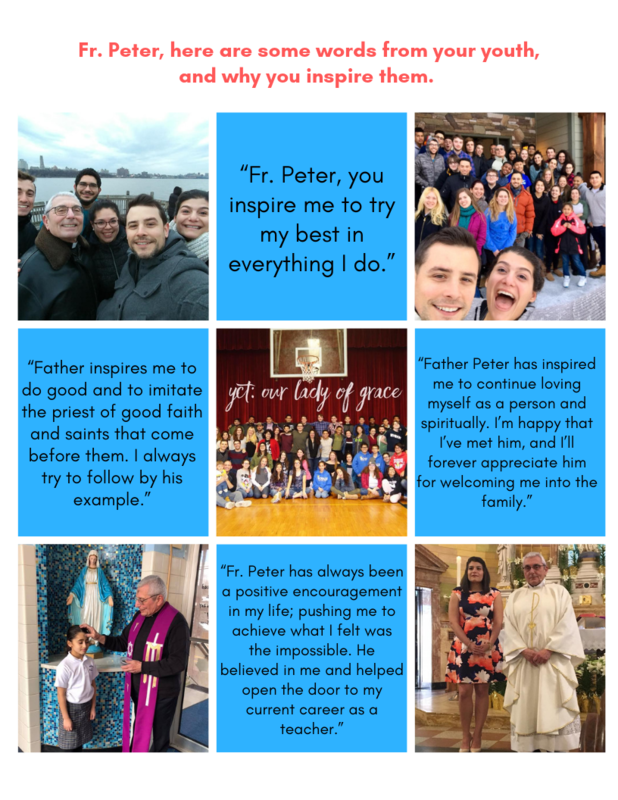 peter Sticco SAC celebrates 50 years a priest! Fr. Peter you are our mentor and leader. Your YCT family loves you so much, and are ever appreciative of everything you do for us. Thank you for your ongoing love and support, and may God continue to bless you! In thanksgiving of Fr. Peter’s boundless service to God and His people, here is an excerpt from Pope Francis’ 2014 homily on Holy Thursday, which speaks of priestly joy; a joy which is anointing, imperishable, and missionary. We recall the happy day of the institution of the priesthood, as well as the day of our own priestly ordination. The Lord anointed us in Christ with the oil of gladness, and this anointing invites us to accept and appreciate this great gift: the gladness, the joy of being a priest. Priestly joy is a priceless treasure, not only for the priest himself but for the entire faithful people of God: that faithful people from which he is called to be anointed and which he, in turn, is sent to anoint. Anointed with the oil of gladness so as to anoint others with the oil of gladness. Priestly joy has its source in the Father’s love, and the Lord wishes the joy of this Love to be “ours” and to be “complete” (Jn 15:11). I like to reflect on joy by contemplating Our Lady, for Mary, the “Mother of the living Gospel, is a wellspring of joy for God’s little ones” (Evangelii Gaudium, 288). I do not think it is an exaggeration to say that priest is very little indeed: the incomparable grandeur of the gift granted us for the ministry sets us among the least of men. The priest is the poorest of men unless Jesus enriches him by his poverty, the most useless of servants unless Jesus calls him his friend, the most ignorant of men unless Jesus patiently teaches him as he did Peter, the frailest of Christians unless the Good Shepherd strengthens him in the midst of the flock. No one is more “little” than a priest left to his own devices; and so our prayer of protection against every snare of the Evil One is the prayer of our Mother: I am a priest because he has regarded my littleness (cf. Lk 1:48). And in that littleness we find our joy. Joy in our littleness! For me, there are three significant features of our priestly joy. It is a joy which anoints us (not one which “greases” us, making us unctuous, sumptuous and presumptuous), it is a joy which is imperishable and it is a missionary joy which spreads and attracts, starting backwards – with those farthest away from us. A joy which anoints us. In a word: it has penetrated deep within our hearts, it has shaped them and strengthened them sacramentally. The signs of the ordination liturgy speak to us of the Church’s maternal desire to pass on and share with others all that the Lord has given us: the laying on of hands, the anointing with sacred chrism, the clothing with sacred vestments, the first consecration which immediately follows… Grace fills us to the brim and overflows, fully, abundantly and entirely in each priest. We are anointed down to our very bones… and our joy, which wells up from deep within, is the echo of this anointing. An imperishable joy. The fullness of the Gift, which no one can take away or increase, is an unfailing source of joy: an imperishable joy which the Lord has promised no one can take from us (Jn 16:22). It can lie dormant, or be clogged by sin or by life’s troubles, yet deep down it remains intact, like the embers of a burnt log beneath the ashes, and it can always be renewed. Paul’s exhortation to Timothy remains ever timely: I remind you to fan into flame the gift of God that is within you through the laying on of my hands (cf. 2 Tim 1:6). A missionary joy. 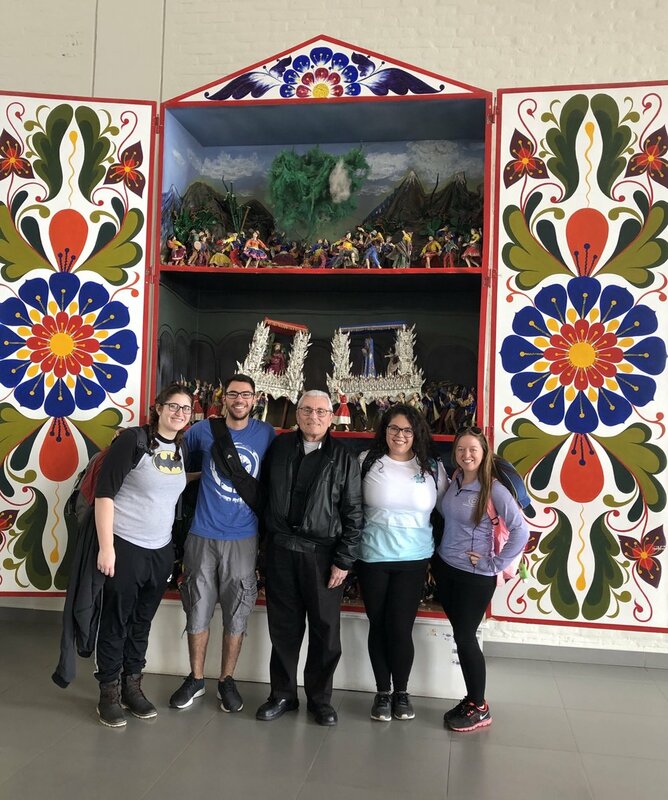 I would like especially to share with you and to stress this third feature: priestly joy is deeply bound up with God’s holy and faithful people, for it is an eminently missionary joy. Our anointing is meant for anointing God’s holy and faithful people: for baptizing and confirming them, healing and sanctifying them, blessing, comforting and evangelizing them. "God is all love; pure love, mad & unthinkable, beyond any limit & measure"